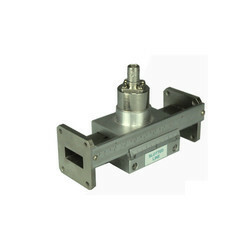 Leading Manufacturer of multi-frequency magnetic guiding agv, 4g ready 0.04-4 ghz rf & mic training lab mic04, 4g ready microwave integrated circuit components, x band microwave waveguide lab mwl10, x band microwave waveguide components and 250khz-15 ghz microwave signal generator msg15 from Jaipur. Multi-frequency magnetic guiding Automated Guided Vehicle (AGV) is a comprehensively projected product, which combines vehicle mechanical technology, human-machine interface, mechatronics, SCM, data fusion, real time digital signal processing, trajectory planning, multiple AI object coordination, and wireless communication theories and technology together. It is a typical intelligent system, as well as a model for the research development of multiple AI system and multiple vehicles control. 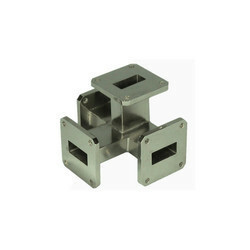 Its theory and technology can be applied in industrial production, factory automatic logistics system, rescue and other practical fields, thus it has high research and application value. It can accept dispatch commands and follow the instruction accordingly. It picks and places stuff to their corresponding locations and sends the messages to the PC when its done. Messages of current status of the vehicle, and environment are also sent back to the PC for better control and management. Vehicle dispatch & pick up Basic function in the production process. The AGV normally remains in stand-by mode if it doesnt receive the production dispatch mission command. Once receiving the command from the workstation, it will execute the pick up (onto the tray) and transportation process automatically and fulfils the system dispatch function. Transportation According to the flexible dispatch requirement of the logistic automation system, AGV can fulfil the automatic docking and loading / discharging of material. The automatic transportation function is thus achieved. 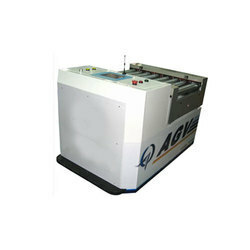 Obstacle Detection AGV will stop when there is obstacle on its way. It will resume motion when the obstacle is gone, and the status of the route is sent to the dispatch control system of the workstation. Anti-bumping A flexible plastic plate and a sensor in the front form the anti-bumping system. Emergency braking of the AGV will be performed if slight bumping is detected in any direction, injury or damage can thus be prevented. Emergency Stop Emergency stop button can be pressed in case of malfunction to protect against damage. Wireless Communication Mutual communication between the AGV and the server (communication interface is reserved) is achieved via 802.11 g/b wireless Ethernet. Vehicle system integration and multiple vehicles system group control are fulfilled via wireless network. Composed of guiding algorithm, obstacle-avoiding algorithm, signal processing, wireless communication protocol and other parts. Guiding algorithm: developed according to multi-frequency magnetic guiding mode of AGV to ensure the vehicle travels in the preset trajectory. Signal processing: process the sensor signal of the guiding module, for guiding algorithm. Obstacle avoiding algorithm: React according to the obstacle-avoiding sensor of the vehicle to ensure the safety stop of the vehicle when obstacle is encountered. Wireless communication protocol: The integrated software interface of the vehicle system is wireless Ethernet communication protocol based on 802.11g/b. High measure speed at all power levels. Measurement in dBm & dB relative. Win7/XP PC control, display and analysis in real time. 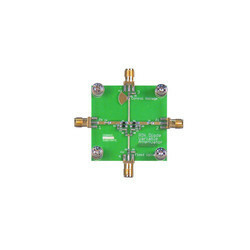 0.5-4 GHz Slotted Line with 1.1 VSWR. 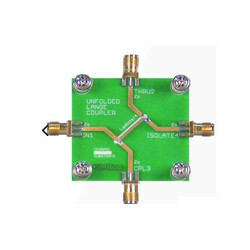 0.5-4 GHz Directional Coupler with 35dB directivity. MIC modules to select from. Tested and calibrated on Network analyser. Wide band Gunn Oscillator, detector and other components. Frequency Coverage 250 KHz to 15 GHz. Very low leakage and harmonics. An anechoic chamber (an-echoic meaning "non-reflective, non-echoing, echo-free") is a room designed to completely absorb reflections of either sound or electromagnetic waves. They are also often isolated from waves entering from their surroundings. This combination means that a person or detector exclusively hears direct sounds (no reverberant sounds), in effect simulating being inside an infinitely large room. Anechoic chambers range from small compartments the size of household microwave ovens to ones as large as aircraft hangars. 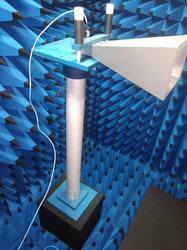 The size of the chamber depends on the size of the objects and frequency ranges being tested. b) SE is tested as per IEEE-299. 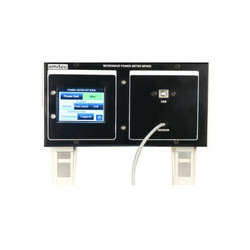 (With VNA interfacing for Automatic Measurement of 3D pattern, gain measurement, Parameter etc). v Maximum load : up to 1Kg. v Azimuthally rotation : 360 degree. Elevation Movement should be +90 degree. 18GHz Ultra Low loss Testing cables. Planar Horn : 0.9 GHz to 12.4 GHz- 2 Nos. Connectors & adapters : SMA (F) to SMA (F) Adapter; N (F) to N (F), adapter. 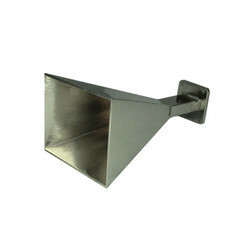 v Planar VNA Planar Horn: 0.9 GHz - 12.4 GHz- 2 Nos. v Gain :5.5dBi @ 1GHz Typ. 8dBi @ 2.7GHz Typ. 5dBi @ 6GHz Typ. Looking for Microwave, Microstrip & RF ?